Overnight Oats – breakfast heaven!! It is getting hot in the desert, which means that porridge for breakfast isn’t so appealing any more. I am keen to stick with oats as they are a great, filling and easy, low GI breakfast, but I just don’t love muesli without cows milk. Thankfully I have recently tried the ‘overnight oats’ that I have seen so many people talking/blogging about and I am in love! Mix the oats and milk in a glass container, then add in honey, cinnamon and vanilla and stir well. 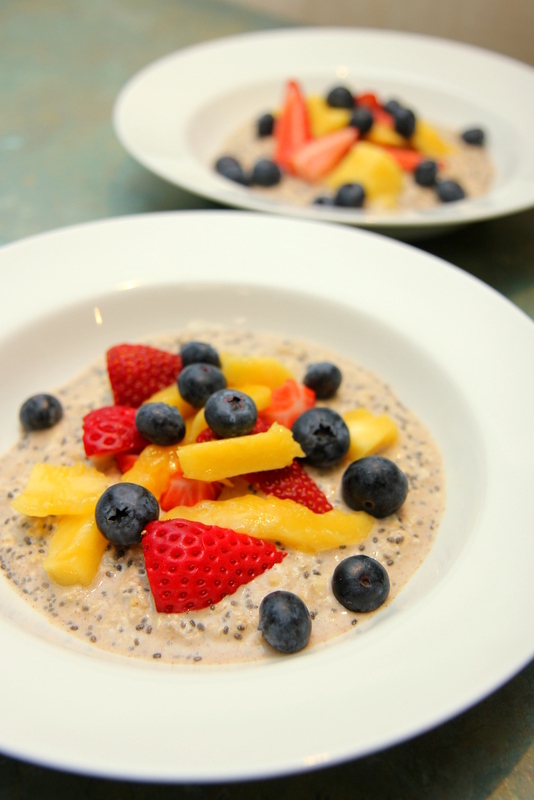 Just before serving in the morning mix through the chia seeds and top with fruit. I have also made this for lunch (on more than one occasion!). Just mix up in the morning and allow at least 4 hours in the fridge. Oh, it looks so beautiful and colourful. Good one. thanks Vini 🙂 Hope you enjoy it! they are a great combination aren’t they? !